Guava is a highly nutritious green tropical fruit that is packed with vitamins, minerals and antioxidants. If you have diabetes or if you are familiar with low-carbohydrate diets, you may be familiar with the glycemic index. Despite the health benefits this fruit offers, you may be curious as to what kind of impact guava has on your blood sugar levels. The glycemic index is a ranking system that rates the after-meal effect a food or beverage will have your on blood sugar levels. Foods ranked 70 and above are considered high glycemic foods, as they will raise your blood sugar rapidly and significantly. Low glycemic foods rank 55 and below and do not have as significant an impact on your blood sugar levels. Foods that rank between 56 and 69 have a moderate effect on your blood sugar. If you have diabetes or you are a dieter who is trying to lose weight, you want to select foods that will not rapidly raise your blood sugar levels. Guava was found to have a glycemic index ranking of 78, according to a study published in a 2011 issue of the "E-International Scientific Research Journal." Guava ranks significantly higher than other fruits, as most fruits rank from 30 to 50. Apples, grapefruit, grapes, oranges and pears all score below 50 on the glycemic index. Only watermelon, which scores 72, plus or minus 13, ranks close to guava. This ranking suggests the guava will raise your blood sugar levels significantly and would be far from an ideal choice for people with diabetes or those trying to manage or lose weight. Dr. Jonny Bowden, Ph.D. and Clinical Nutrition Specialist, in his book "The 150 Healthiest Foods on Earth," states that the glycemic index score of 78 is a very inaccurate measure of guava's affect on your blood sugar. A food's "glycemic load" is a much more accurate measurement of its effect on your blood sugar and insulin levels. The glycemic load accounts for how many carbohydrates the food portion has. Guava's glycemic load is 4 out of 40. This measurement indicates that guava may actually have little to no impact on your blood glucose levels, according to Dr. Bowden. Dr. Bowden lists guava as one of the most nutritious foods that you can eat because it has very high amounts of lycopene. Guava has more lycopene than any other fruit or vegetable at a similar serving size. Lycopene is a carotenoid pigment and powerful antioxidant that may help prevent prostate cancer and breast cancer. Guava is also rich in potassium, vitamin C, vitamin A, calcium and magnesium. 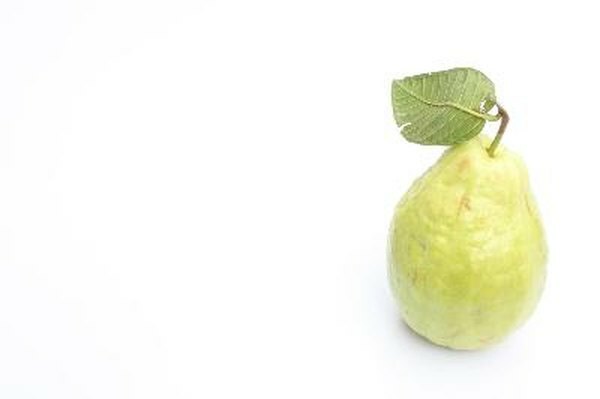 A single cup of guava has 9 grams of dietary fiber. Foods that are high in fiber generally have very marginal effects on blood sugar levels. The 150 Healthiest Foods on Earth; Jonny Bowden, Ph.D.